(Survival Media Agency | The Associated Press) In this Friday, Jan. 18, 2019 image made from video provided by the Survival Media Agency, a teenager wearing a "Make America Great Again" hat, center left, stands in front of an elderly Native American singing and playing a drum in Washington. The Roman Catholic Diocese of Covington in Kentucky is looking into this and other videos that show youths, possibly from the diocese's all-male Covington Catholic High School, mocking Native Americans at a rally in Washington. A short video clip showed Native American Nathan Phillips, playing a traditional drum and in an apparent standoff with a smiling student, Nick Sandmann, who was wearing a “Make America Great Again” hat. 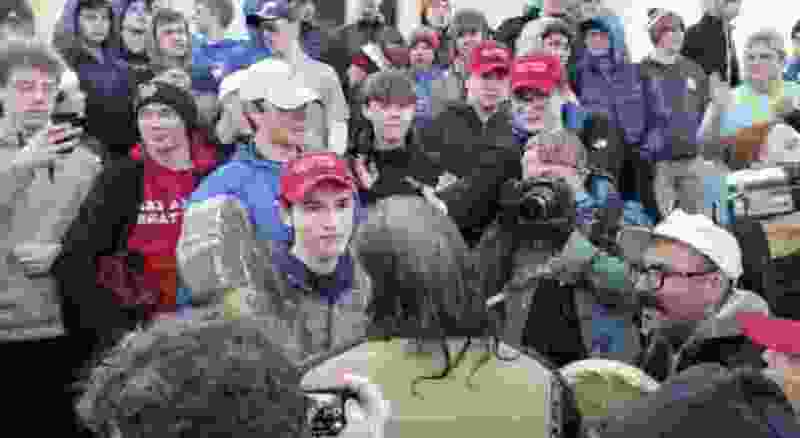 The Diocese of Covington and Covington Catholic High School, a Kentucky private school which arranged the trip, were among those who initially condemned the boys’ actions in the video.